In a clear demonstration of imperialist interventionism, President Trump recognized right-wing opposition leader Juan Guaidó as “interim president” of Venezuela. On Wednesday, tensions in Venezuela rose exponentially after Juan Guaidó, leader of the country’s right-wing opposition and President of the National Assembly, proclaimed himself interim president. Guaidó has received significant international support, including an endorsement from President Trump. In response, Venezuelan President Nicolas Maduro broke diplomatic ties with the United States and ordered U.S. diplomats to leave the country within 72 hours. The Latin American governments allied with the United States also recognized the self-proclaimed interim president of Venezuela in a coordinated effort to get Maduro out of the presidency in what seems to be an escalation leading to a coup. Maduro was sworn in on January 10 to begin a new six-year term in the midst of a massive economic and political crisis. From the start, the Trump Administration did not recognize his presidency, nor did Guaidó. Maduro finds himself increasingly isolated among a sea of right-wing governments in Latin America as Venezuela suffers deeply from U.S. sanctions that began in 2015. Hunger and poverty brought about massive mobilizations over the past year and a massive political crisis for the Maduro government, which has been in power since Hugo Chavez’s death in 2013. On Wednesday, both the government and the right-wing opposition called for mobilizations. Last week, marches called by Guaidó barely gathered a crowd. 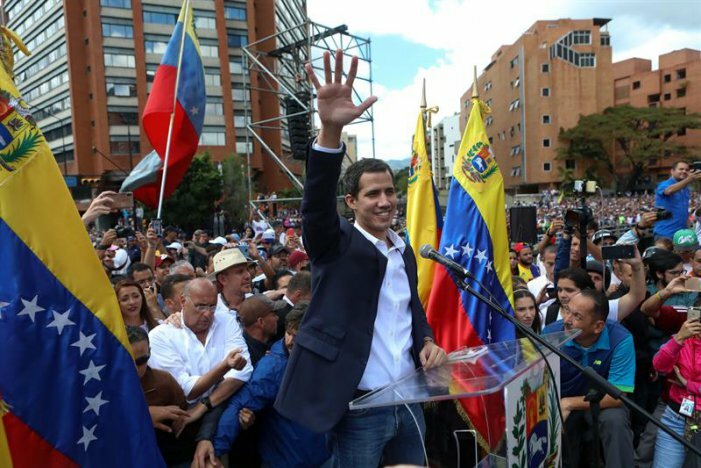 Guaidó, 35, was essentially unknown in Venezuelan politics and lacked popular support until he catapulted into the limelight with Trump’s approval and attempted to take power. In the past year, the opposition has been deeply divided, mostly sitting out the 2018 elections, when two opposition candidates ran for presidential office. Guaidó was elected to the National Assembly in 2015 and elected president of the Assembly in 2018. Since then he has taken the reins of the opposition, and, in a bold grab for power, claimed that Maduro is illegitimate. The past few days have been tumultuous, with members of the National Guard turning on Maduro and the rumblings of a coup. Tens of thousands mobilized in Caracas on Wednesday to watch Guaidó swear himself in as interim president, arguing that the previous election of Maduro was unconstitutional and calling for new elections. He said, “The people of Venezuela have courageously spoken out against Maduro and his regime and demanded freedom and the rule of law.” While certainly, the people of Venezuela have demonstrated continued discontent with Maduro, in the past months there have been few mobilizations and no indication that Guaidó would be selected as leader. Guaidó went on to say that he would use “the full weight of United States economic and diplomatic power to press for the restoration of Venezuelan democracy”—a disgustingly obvious oxymoron. A few minutes after Guaidó was sworn in as interim president, Trump announced that he recognized Guaidó as “legitimate president,” in an open violation of Venezuela’s national sovereignty. 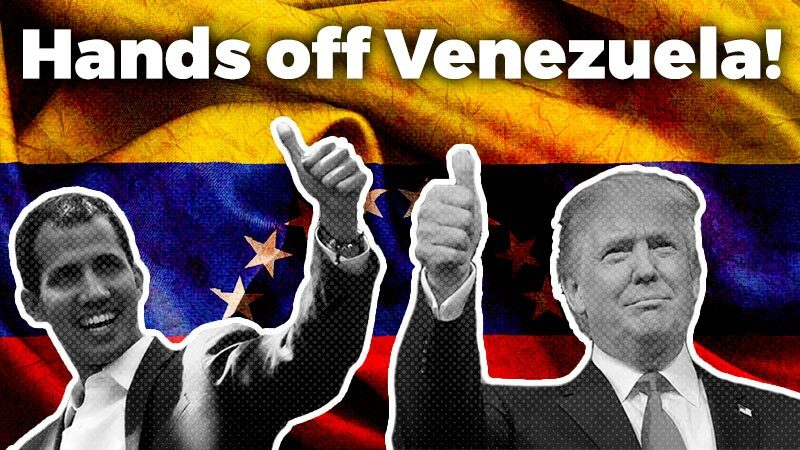 This support comes as no surprise, since the Trump administration has issued videos and statements in support of ousting Maduro over the past week, including a video by Vice President Pence to the Venezuelan people encouraging them to rise up against Maduro. On the other hand, the Supreme Court of Venezuela has ruled all actions to oust Maduro null and void. Despite the clear backing from imperialist interests, Guaidó cynically invokes national sovereignty as the basis for his coup attempt. Guaidó was not elected president and is clearly making an unprecedented power grab by attempting to win over sectors of the military with the backing of the United States and a global right. Yet, he invokes democracy as the basis for his actions. At the demonstration called by the government in Caracas, Maduro announced his decision to break diplomatic and political relations with the U.S. government, accusing Trump of “interventionism” and giving U.S. diplomats 72 hours to leave the embassy. “I have decided to break diplomatic and political relations with the imperialist government of the United States,” Maduro said. The United States has already declared that it has no intention to remove its diplomats from Venezuela, setting the stage for a showdown. Despite the calls of the self-proclaimed new president to the army, Major General Vladimir Padrino López, head of the Venezuelan Armed Forces, declared that the military will not accept “a president imposed in the shadow of obscure interests or self-proclaimed outside the law.” So far, there are no signs that significant sectors of the army are willing to support the coup attempt. On Wednesday, the military repressed Maduro’s opponents in the streets, showing that the armed forces remain loyal to the government. Maduro’s predecessor, Hugo Chávez, was part of the Pink Tide that swept Latin America in the early 2000s. Riding a wave of economic prosperity and based on increased trade with China, progressive governments came to power throughout Latin America seeking to maintain capitalist profits while providing some concessions to the working class. These governments included Lula and later Dilma Rousseff in Brazil, Néstor and Cristina Kirchner in Argentina, Evo Morales in Bolivia and Chávez in Venezuela. 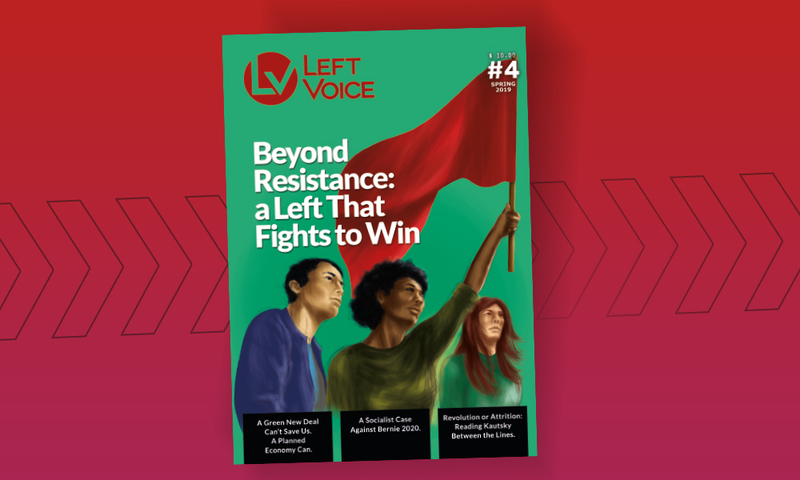 As economic crisis hit and Pink Tide governments began to implement austerity policies against the workers, a wave of right-wing governments came to power in Latin America. These same governments are now supporting the coup against Maduro. The head of the Organization of American States (OAS), Luis Almagro, recognized Guaidó as the new interim president. In the same vein, Mauricio Macri from Argentina and Jair Bolsonaro from Brazil expressed their support for the “new legitimated president of Venezuela,” as did the governments of Costa Rica, Ecuador, Peru, Chile, Guatemala and Paraguay. These are the members of the so-called Lima Group, which since its foundation has faithfully followed the orders of Washington. Mexico, with their new President Andres Manuel Lopez Obrador is the only country in the Lima Group which is backing Maduro. It is not surprising that Bolsonaro was the first Latin American leader to follow the Trump’s lead and support Guaidó. Doing so was not only about doing the bidding of U.S. imperialism. Rather, there is a right-wing project underway for all of Latin America, with Bolsonaro at the head which seek to eradicate working-class gains, impose austerity and rebuild American hegemony in the region. If we were to write even a little bit about U.S. interventions in Latin America, this article would already turn into the length of a doctoral dissertation. For now, suffice it to say that the United States has a very long history of intervening in Latin America to further the interests of U.S. corporations and the U.S. government. In Venezuela, the United States attempted a coup in 2002 against Chávez, which he successfully fought back. The coup attempt then was in response to policies that did not favor U.S. corporations and was supported by an internal right-wing opposition to Chávez. The Obama administration continued many Bush policies in relation to Venezuela, including funding the opposition to Chavez and later Maduro, refusing to recognize Maduro as the winner of the 2013 elections and pressuring the OAS to turn on Maduro. Thus, both Democrats and Republicans have supported destabilizing and ousting the Venezuelan leader. 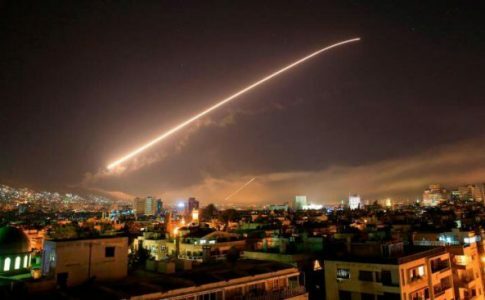 Under the Trump administration, there has been a clear escalation of imperialist policies. 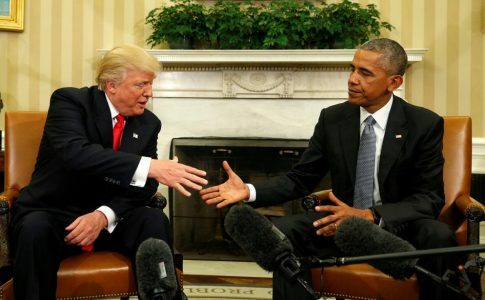 Trump has long included Venezuela in the “Troika of Tyranny”: Venezuela, Cuba and Nicaragua, enforcing greater and harsher sanctions on the country and creating increased economic misery for the country’s poor and working class. He promotes the idea that Venezuela is a violent dictatorship and a dangerous communist country, attempting to revive anti-Communist, Cold War sensibilities. The Trump administration, even with its revolving door of leaders, has been unanimous in hinting that a coup would be favorable. In 2017, Trump discussed a “military option” in Venezuela as did Rex Tillerson in 2018. But we must be extremely clear: Guaidó is on the road to becoming the leader of Venezuela not because the working class of Venezuela wills it, but because the United States has named him leader. Amid a government shutdown for a xenophobic wall that has left thousands of American workers without pay, the U.S. government is working to oust Maduro in order to spread U.S. influence in the region and open greater space for U.S. corporations. This is a warning to all Latin Americans: The U.S. wants tighter control over their South American backyard, and the region’s right wing is opening the doors for it to do so. The absolutely twisted logic of an American president and vice president calling for the ousting of another country’s president, violating every semblance of sovereignty in the name of democracy should be placed front and center in our analysis. This has nothing to do with democracy or with any violations by the Maduro government, given that the U.S. government is guilty of a thousand times more violations of human and democratic rights. Yet calling out the U.S. government for its actions in Venezuela does not mean giving political support to Maduro’s Bonapartist and repressive government, which is also responsible for the political, social and economic crisis that overwhelms the Venezuelan masses. Under the illusion of defending the Bolivarian revolution, which was never a revolution, Maduro has consolidated power and taken away the democratic rights of the Venezuelan people, such as the violent repression of protests, the persecution of activists and the subordination of unions to the government. “Socialist” Venezuela is nothing but a mirage embellished by official demagoguery. 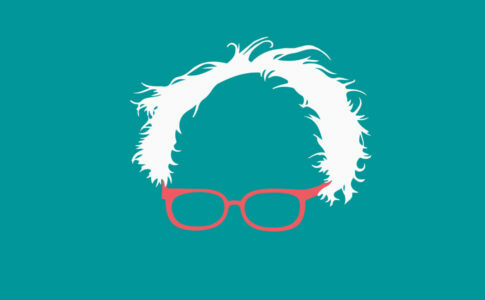 Venezuela is not and never was socialist, so we can and must criticize Maduro and Chávez from the left. In response to the economic and political crisis, the Maduro government has further squeezed the working class and implemented austerity. The only favorable way out for the working class is to mobilize independently of the Maduro government against the coup mandated by Washington. Yet Venezuelans must also fight the government, its repression and its austerity. A socialist perspective must therefore unite the democratic aspirations of both the mass movement and the anti-imperialist struggle to stop the coup. In the United States, it is more urgent than ever to raise our voices and take the streets in solidarity with the Venezuelan working class. If the coup led by Trump triumphs in Venezuela, all of Latin America will face worse conditions to fight off U.S. imperialism, along with greater austerity imposed by a strengthened national right wing. 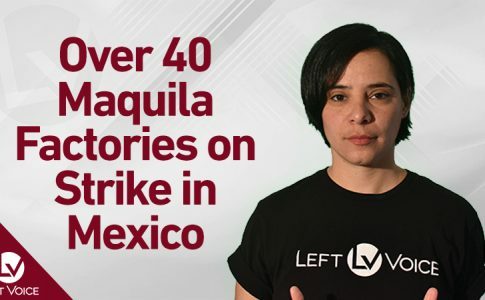 Jimena participated in the year-long strike at the Autonomous National University of Mexico (UNAM) in 1999-2000, and was thrown in prison because of her role. 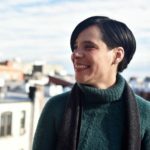 She is an author of the collection "Mexico en Llamas" and lives and works in New York City. Nothing good can come of this bombing or any other imperialist military intervention.